The Samsung DS-5021D is designed for heavy phone users and is also referred to as the Samsung Navigator 21 Button Handset. The Samsung DS-5021D is designed for heavy phone users and is also referred to as the Navigator 21 button handset. The difference between this and the model up, the DS 5038 phone, is that it offers less programmable buttons (21 vs. 38). However this handset features the very user friendly navigator jog dial that is sacrificed on the larger handset for the extra buttons required by reception. The multidirectional navigator makes it easier for users to access speed dial, directory dials, incoming/outgoing call logs and more. This is why you see jog dials on most modern phone handsets. The Samsung DS 5021 phone also has both black as well as black/silver options to suit. The screen on the navigator 21 button is only 2 lines with 24 characters per line because unlike IP phones you won't be accessing advanced multimedia applications that require anything larger. That said the screen is still smaller than many of the modern digital competitors. The key difference between this and the cheaper digital phone models is you get 7 more programmable buttons as well as the navigator which is only available on the DS 5014D phone not the DS 5014S. Apart from that they are identical. The 21 programmable buttons have accompanying multicolour LED status indicator lights so you can easily and clearly distinguish between staff that are available, busy or in DND mode. If you don't need to see 21 staff and/or phone lines at a glance then the DS 5014 handset would be the cheaper and smarter alternative. If you do need more than the 21 buttons for larger companies you can add an additional DS-5064 add on module (AOM) with a further 64 buttons each with their own LED indicator lights. As a maximum you can connect up to 4 x AOM modules to provide 277 users at a glance with the DS-5021D phone. The reality is if you have lots of staff you may be better implementing the OfficeServ Operator on a PC. This is a faster, more efficient way to handle volumes of calls and everything is done with a simple mouse click. Below the screen on the DS 5021D phone you'll also find 3 context sensitive soft keys. These smart keys are designed to present on screen options that change from function to function. This way you are always shown the best, most common options which make daily phone use much easier. Soft keys like this are becoming standard across most brands (both digital and IP phones) because of the ease of use. With the Samsung DS-5021D phone you also get a quality speakerphone and mic for hands free operations. Headset ports are standard as are 7 fixed function buttons that cover everyday features like voicemail access, conference calling, transfer, hold etc. If you're after full duplex sound quality, like you find on leading Polycom conferencing solution, you can also purchase an add on adaptor to achieve this. Full duplex presents a much clearer conferencing solution as it doesn't clip voices when multiple parties are talking at the same time. The Samsung DS-5021D phone also comes with 8 selectable ring tones. This is particularly handy in open office environments which are so popular today. There is also an optional wall mounting option available for the DS-5021D handset if you need it. One of the smart features of all Samsung 5000 phone handsets, and also the Samsung SMT 5000 IP series, is that staff can easily customise the Navigator 21 handset themselves via Samsung's proprietary Easyset application. OfficeServ Easyset is simply loaded onto a user's PC and allows them to change features on the DS-5021 digital phone like Extension LED indicator light functions, Divert Target, Divert Condition and Personal Speed Dial etc using their mouse. This eliminates the need for outside parties or system administrators to be involved in individual staff customisation. It also means they can change it whenever they want for free. Digital handsets like the DS-5021D are a very smart choice for users that don't benefit from IP handsets. They're cheaper but will not compromise on the features required by even the heaviest phone user. With all OfficeServ IP Pbx solutions you can implement any combination of IP, Digital, Wireless or Analogue handsets. Getting the right handset composition is the easiest way to keep your implementation costs down. If you already have existing structured CAT5 or CAT 6 cabling in place then weigh up the pro's and con's of IP vs. Digital handsets for yourself. 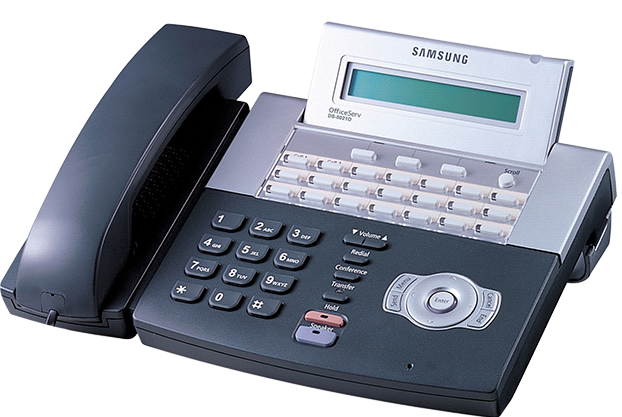 If you are looking for an equivalent level VoIP (IP) phone then you should check out the Samsung SMT-i5210 IP phone or the Samsung SMT-i5220 IP Phone. Below you will find the comparison table for the Samsung 5000 digital phone series and you can clearly see the differences highlighted between the DS-5021D digital phone and other models. Looking to learn more about Samsung DS-5021D Phone Handset?